Mental health disorders represent a largely hidden but substantial proportion of the world's disease burden. Projections of the global burden of disease place depression as the leading cause of disability-adjusted life years by 2030, and mental and substance use disorders are currently the leading cause of disability worldwide (WHO 2012). Mental health disorders are often neglected, especially in low- and middle-income countries, which have limited resources to tackle mental health challenges. In addition to causing significant burden within the lives of individuals, families, and societies, mental health disorders increase the risk for comorbid conditions. Untreated, mental health disorders greatly impact the health and social functioning of societies as well as the economic productivity of the regions affected. 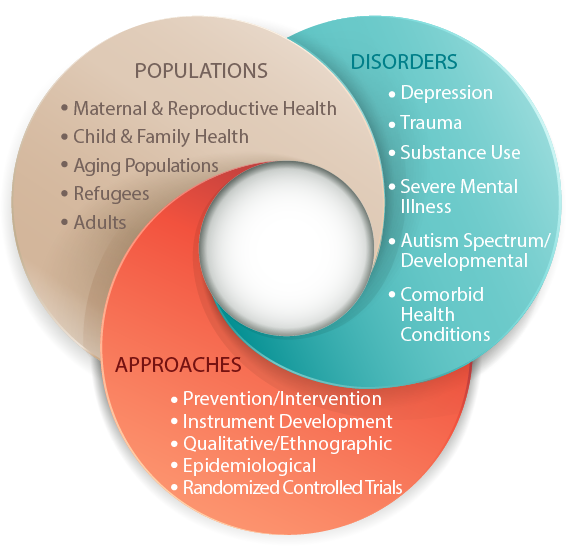 Although effective mental health management practices exist, barriers to implementation, including socioeconomic, societal, and contextual factors, disproportionately affect low-resource settings. Within the global context, research identifying individuals in need of mental health care, assessing the effectiveness of interventions and their implementation, and developing new and innovative methods are critically needed. The Global Mental Health Initiative is based on an interdisciplinary approach across a wide range of populations and research methodologies to enhance the assessment and treatment of mental disorders in global settings. Duke has a significant number of faculty working in global mental health. DGHI collaborates with departments within the Trinity College of Arts and Sciences, the Pratt School of Engineering, the Nicolas School of the Environment, the Sanford School of Public Policy, the School of Medicine, and the School of Nursing. The Global Mental Health (GMH) Initiative coordinates research collaboration among faculty, maximizes educational opportunities, sponsors a speaker series, and funds pilot studies on an annual basis. DGHI seeks to provide pilot funds to further develop interdisciplinary research in global mental health, with the larger goal of enabling investigators to leverage preliminary findings and data to obtain larger awards of external funding. Collaborative and interdisciplinary proposals are especially encouraged. Proposals that support a sustainable career trajectory in global mental health will be prioritized. This list is for anyone interested in global mental health research or education. Announcements related to speakers and talks, courses, publications and funding will be shared periodically. 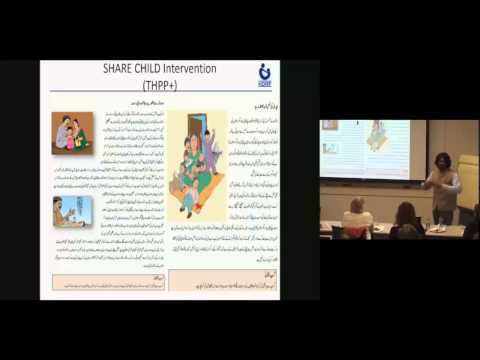 Joanna Maselko and Brandon Kohrt were funded by the Initiative to adapt culturally appropriate neuropsychological tools to be delivered in tablet-based formats for South Asian adolescents at risk of suicide and develop and document an innovative technologies systematic adaptation procedure that can be applied to other GMH settings. They will accomplish this task by using qualitative research with adolescents to develop culturally appropriate stimuli for a neuropsychological assessment, develop tablet-based version of neuropsychological tests, and pilot tablet-based administration with adolescents. Through collaborations with other departments, this research study brings an innovative method to DGHI which can be used in the validation of future tools used in South Asia. Lauren Franz and colleagues (including the co-developers of the intervention Dr. Geraldine Dawson and Dr. Sally Rogers) will draft a version of the Parent Early Start Denver Model (P-ESDM), a caregiver-mediated early autism spectrum disorders (ASD) intervention for use in an African setting. In order to produce the adapted P-ESDM intervention, the research team will answer 3 key questions: 1) What are the core components of P-ESDM? 2) What is the adaptable periphery of P-ESDM? 3) What contextual factors are particularly relevant to the implementation of a caregiver-mediated ASD early intervention in an African setting? This research will be conducted at the Center for Autism Research in Africa (Director: Professor de Vries) at the University of Cape Town in South Africa. It will form the foundation for future work proposed by Dr. Franz that aims to assess the acceptability, feasibility, and impact of this brief caregiver-mediated intervention for autism adapted for use in a low resource setting. Eric Green and colleagues at Moi University (Diana Menya, Irene Chesire) and the Moi Teaching and Referral Hospital (Edith Kwobah) in Kenya developed and validated a screening instrument for perinatal depression that can be administered to women regardless of literacy level through an automated phone call or in-person by a lay health worker or provider in a primary care setting. Eve Puffer and colleagues will assess the criterion validity of a direct observational tool for assessing family interaction patterns, as a major barrier to conducting rigorous trials of family interventions in low- and middle-income countries is a lack of assessment tools. Puffer and her team used qualitative data to inform the development of an assessment in which families are videotaped while interacting with one another, allowing for coding of interaction patterns. With this funding, Puffer will compare the results of this assessment with results of in-depth interviews with the families—the “gold standard” measure of family functioning in this study. The expected outcome is a direct observational measure of family functioning that is feasible and validated in a low-resource setting. Eve Puffer and colleagues plan to address the lack of culturally- and contextually-valid assessment tools for both clinical and research. Having previously tested a battery of assessment tools for measuring family functioning, Puffer and colleagues completed a pilot of a family therapy intervention that showed initial positive outcomes in a small sample. With this funding, Puffer plans to test the improved intervention and novel church-based implementation by providing the therapy to the distressed families in the assessment tools validity study. This is an ideal sample for the next trial of the intervention, and the results would also confirm that the assessment tools are clinically useful. Dr. Puffer’s research is conducted in close collaboration with Professor David Ayuku, a clinical psychologist at Moi University Teaching and Referral Hospital in Eldoret, Kenya. Professor Ayuku’s research focuses on addressing mental health risk factors in low-resource communities in Kenya, including work related to high-risk populations of orphans and street children. Dr. Puffer and Dr. Ayuku have been collaborating since 2012 on a range of studies, including studies to understand mental health risk and family functioning; studies to develop measures; and those to develop culturally- and contextually-anchored interventions. This collaboration is facilitated through AMPATH, a consortium of North American Universities (including Duke) and Moi. Eldoret is a priority partnership location for DGHI. Lauren Franz and Petrus de Vries proposed the establishment of a collaborative partnership between the Division of Child and Family Mental Health and Developmental Neuroscience at Duke University and the Division of Child and Adolescent Psychiatry at the University of Cape Town (UCT). The collaboration encompassed research, education, clinical services, and social responsibility. The collaboration was bi-directional with mutual sharing of local resources, knowledge, and challenges. 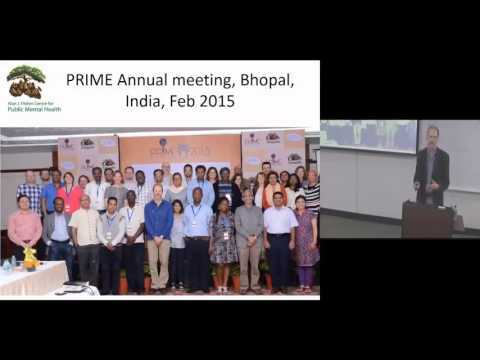 The team planed to pilot programs with shared aims concurrently in both settings. These pilots not only advanced specific programmatic aims, but they also advanced our understanding of how pediatric mental health systems, resources, and needs and similar and different with real-world experiences and data. Lauren Franz will continue her partnership with researchers in Cape Town, South Africa around child and adolescent mental health with a focus on clinically-relevant research. With the prior assistance of DGHI, Franz initiated a two-day meeting with Cape Town collaborators identifying a number of shared project for next-step action, including the potential implementation and evaluation of Parent-Child Interaction Therapy (PCIT). The PCIT project intends to conduct focus groups with parent, providers, and key stakeholders to assess the potential for uptake of the treatment model; to hold a one-day workshop for community providers to introduce the basic behavioral principles of PCIT; to conduct a 40 hour training on PCIT with at least 2 South African clinicians with follow-up supervision; and to examine the feasibility of school-based TCIT (teacher-child IT) in a local primary school setting. Baumgartner JN, Parcesepe A, Mekuria YG, Abitew DB, Gebeyehu W, Okello F, Shattuck D. Correlates of postpartum common mental disorders: Results from a population-based study in Amhara region, Ethiopia. Archives in Women’s Mental Health; 2016 19(5), 937-942. Green, E. P., Blattman, C., Jamison, J., & Annan, J. (2016). Does poverty alleviation decrease depression symptoms in post-conflict settings? 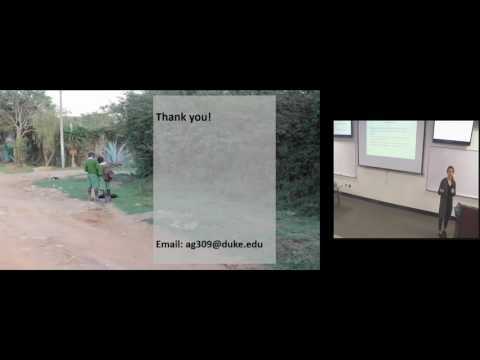 A cluster-randomized trial of microenterprise assistance in Northern Uganda. Global Mental Health, 3, e7. Proeschold-Bell, R.J., Miles, A., Toth, M. Adams, C, Smith, B., & Toole, D. (2013). Using effort-reward imbalance theory to understand high rates of depression and anxiety among clergy. Journal of Primary Prevention, 34(6), 439-453, doi: 10.1007/s10935-013-0321-4. Puffer, E. S., Green, E. P., Sikkema, K. J., Broverman, S. A., Ogwang-Odhiambo, R. A., & Pian, J. (2016). A church-based intervention for families to promote mental health and prevent HIV among adolescents in rural Kenya: Results of a randomized trial. Journal of Consulting and Clinical Psychology, 84(6), 511. Meade, C.S., Watt, M.H., Sikkema, K.J., Deng, L.X., Skinner, D., Pieterse, D. & Kalichman, S.C. (2012). 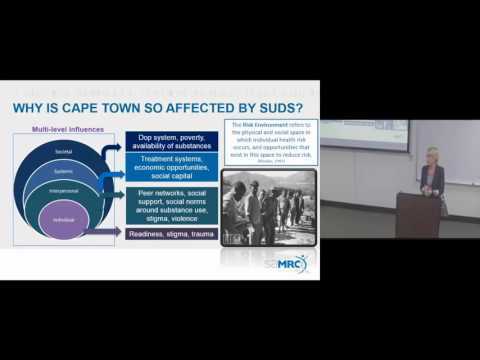 Methamphetamine use is associated with HIV risk among patrons of alcohol serving venues in Cape Town, South Africa. Drug and Alcohol Dependence, 126, 232-9. PMCID: PMC3465508.